The Maine lobster fishery is a successful example of a managed natural resource commons. To ensure an ongoing supply of lobsters in the face of threats to the fishery from unregulated overfishing, over a period of years Maine lobster fisher­men crafted a set of formal and informal rules to determine who can harvest lobsters, at what times and places, and in what volume. By design, the product of their efforts is a commons, a managed-access governance regime that allows both lobsters and the lobster industry to flourish. How do such commons work? Where do they come from, what contributes to their durability and effectiveness, and what undermines them? These questions are at the heart of an institutionalist research paradigm that has been extremely successful in understanding the successes and failures of natural resource commons arrangements.1 In “Constructing Commons in the Cultural Environ­ment” (hereafter,“Constructing Commons”), published in the Cornell Law Review, we confronted the challenge of understanding the governance of what we refer to as constructed commons in the cultural environment. In constructed commons the resources to be produced, conserved, and consumed are not crustaceans but information: copyrighted works of authorship, patented inventions and other forms of information and knowledge that may not be aligned with formal systems of intellectual property law (Madison, et al. 2010). The Constructing Commons framework suggests a means to investigate the social role and significance of constructed commons institutions. This inves­tigation is relevant to property law in particular and social ordering more generally. The conventional view of property scholars, particularly those with interests in intellectual property law, is that resource production and consumption are, and ought to be, governed primarily by entitlements to individual resource units, held individually and allocated via market mechanisms. To the extent that those market mechanisms are inadequate to optimize the welfare of society, in the event of market failure, government intervention is the suggested remedy. Intellectual property rights themselves are generally justified as remedies for market failure. Creative works and new inventions are characterized as public goods, whose intangibility prevents their originators from excluding potential users and thus recouping their investments via pricing. Copyright and patent laws create artificial but legally sanctioned forms of exclusion, restoring a measure of market control to creators and innovators. The conventional view regards communal and collectivist institutions, parti­cularly those that blend informal normative structures with formal govern­ment rules, as exceptional and dependent upon pre-existing property entitlements. Systematically performing and analyzing case studies of constructed cultural commons across a wide range of domains according to the proposed framework offers a critical method for assessing the validity of this property-focused narrative. The phrase “constructed cultural commons,” as we use it, refers to socially constructed institutions for developing and sharing cultural and scientific knowledge in a formally or informally managed way, much as a natural resource commons refers to the type of managed-sharing environment for natural resources exemplified by the Maine lobster fishery. A commons is neither a place nor a thing. Rather, a commons is a resource management or governance regime. Cultural commons are regimes for manag­ing the sharing of information or cultural resources. Commons are “constructed” in the sense that their creation, existence, operation and persistence are matters not of pure accident or random chance, but instead of emergent social process and institutional design. Examples of constructed cultural commons include intellectual property pools, in which owners of patents in a technological domain license their patents to a common “pool” from which producers of complex products can obtain all of the permissions needed to make and sell goods that use the patents; open source computer software projects, which offer users of open source programs the ability to create and share modifications to the programs; Wikipedia, which offers users of this Internet encyclopedia the power to add to and edit its contents; the wire service for journalism operated by the Associated Press, which allows individual member media outlets the opportunity to publish work produced by other members; and “jamband” fan communities, which record, share and comment on musical performances of their favorite groups –with the permission of the artists themselves. The best-known jamband is the community that grew up around and that is still associated with the Grateful Dead. These examples differ from one another in many significant respects. They share certain basic structural features, as governance regimes for sharing inform­ation or cultural resources, that make them well-suited to comparative analysis. Participants design these environments with limitations tailored to the character of the resources, interests, and communities involved. Commons do not operate solely via market transactions grounded in traditional proprietary rights, nor are they structured exclusively by government regulation. Research on intellectual property and related cultural resources has generally failed to focus sufficiently on managed sharing or on the governance of cultural resources via collective mechanisms. The theoretical discussion of intellectual property policy has been focused on extremes of exclusion and open access, ignoring a wide range of constructed commons that persist between these extremes.2 Such discussion is often divorced from empirical studies of creative and inventive communities. In Constructing Commons, we argue that it is high time to devote more attention to the middle ground of constructed cultural commons. Research on the Maine lobster fishery and other natural resource commons is grounded in the case study approach pioneered by Elinor Ostrom and her colleagues. That approach employs a so-called “Institutional Analysis and Development” (IAD) framework of structured inquiries to study a variety of commons arrangements before moving on to create theories and models to explain them (Ostrom, 1990). A simple illustration of the framework in a cultural context might be a soccer (football) league. The formal rules of soccer are fixed, but the rules-in-use clearly vary somewhat between a professional league and a recreational league, between children’s leagues and adult leagues, and so forth. A specific soccer league is also characterized by the relationships among the players (neighbors, professional competitors, friends, etc. ), by the attributes of the fields on which games are played, and even by the climate of the places where the games take place. The action arena (soccer games) depends on complex and specific interactions among all of these characteristics. Nonetheless, the outcomes over time in a particular league are the patterns of interaction that are clearly identifiable as “professional soccer,” “friendly weekend game,” “children’s soccer league” and so forth. Moreover, some leagues may be successful, lasting for years even as players come and go, while others will fail. The goal of applying the IAD framework of analysis in this context would be to use analysis of many different soccer leagues to come to an understanding of success and failure as a function of specific context. In other words, what we want to know is what features of commons lead to it being productive and stable? What features undermine commons? Under what circumstances are commons solutions to be preferred or accepted as matters of public policy, and under what circumstances do commons risk causing social harm? The method of structured inquiry has the advantages of a systematic approach without prematurely imposing any one theoretical paradigm on the study of commons. It allows the complexity of real-world commons arrangements to inform the search for theoretical understanding rather than papering over such complexity in an attempt to shoehorn existing commons arrangements into a pre-existing model. After engaging in a large number of such studies, Ostrom’s approach permits generalization (for example, with regard to design principles for successful commons3) along with more specific theorizing, modeling and even experimental studies of particular aspects observed in the case studies. Building on Ostrom’s work, we propose and argue for the use of a similar framework to systematize case-study-based research exploring the construction of cultural commons. The time is ripe for such an approach, as a number of scholars have begun to do case studies of constructed cultural commons. However, they tend to have studied isolated areas (such as open source software or academic publishing) and to have considered a limited number of descriptive variables. This makes integration and learning from a body of case studies quite difficult, which in turn discourages people from pursuing further case studies. Constructing Commons adapts, extends and distinguishes Ostrom’s IAD framework to account for important differences between constructed cultural commons and natural resource commons. We briefly discuss only a few of the most important issues that distinguish the inquiries necessary for studying them. Most important, unlike commons in the natural resource environment, cultural commons arrangements usually must create a governance structure that produces the relevant resources as well as provides for sharing existing resources.4 This characteristic of cultural commons creates a more intertwined set of exogenous variables, since separating the managed resources from the attributes and rules-in-use of the community that produces them is impossible. Picture a university, which for our purposes should be considered a cultural commons. Faculty and students within a university share existing knowledge and knowledge resources (such as scholarly literature, archival material and research subjects) and collaborate in the production of new knowledge. That activity is rarely limited by proprietary claims made by faculty or students against one another. The university and its many units, departments and disciplines are governed by a detailed scheme of internal regulation. There is also an increasing interest in detailed legal regulation of the process of technology transfer, the point at which the cultural commons of the university intersects with the proprietary marketplace beyond the university’s walls (Madison, Frischmann and Strandburg 2009). In cultural commons, distinguishing outcomes from resources and com­munity attributes is not strictly possible, since the interactions of the participants in such a commons are inextricably linked with the form and content of the knowledge output, which in turn is itself a resource for future production. These differences call for a set of inquiries tailored to cultural commons. Because the resources shared within a cultural commons are culturally constructed and nonrivalrous,5 defining the boundaries of the commonly managed resource is a different task than in the natural resource commons context. We suspect that, over time, the constructed cultural commons framework that we describe will yield a far larger and richer set of commons cases in the cultural context than one might discover by focusing only on patent law or scientific research or software development. The logical and normative priority assigned to proprietary rights and government intervention may turn out to be misplaced; social ordering both depends on and generates a wide variety of formal and informal institutional arrangements. Importantly, understanding commons in the cultural environment is likely to shed light on the ways in which managed sharing or openness with respect to cultural resources generates the “spillovers,” or third-party benefits, that are critical to the welfare effects of those resources. (Frischmann and Lemley 2007; Frischmann 2008). The social value of information lies not only in its effect on the producer and the consumer of that information, but also in the ways in which the consumer shares that information with others. Understanding the origins and operation of constructed cultural commons requires detailed assessments that recognize that commons operate simultaneously at several levels, each nested in a level above, and that each level entails a variety of possible attributes. We suggest buckets or clusters of issues that should guide further inquiry, including the ways in which information resources and resource commons are structured by default rules of exclusion, and the ways in which members of these pools manage participation in the collective production and extraction of information resources. Case studies across disciplines and reviews of existing literature that address cultural commons will help specify relevant attributes within each cluster. We expect the framework to evolve further as researchers apply it to specific case studies. Beyond our proposal of a framework for studying commons, our consideration of constructed cultural commons also highlights a number of points that are important in the study of intellectual property going forward. Considering con­structed commons helps to elevate collective, intermediate solutions to their possible place of significance in accounts of property regimes and should diminish the skepticism of many scholars that collective solutions can work beyond narrowly defined situations. Case studies will also call our attention to the constructed, designed character of both the cultural and the legal environment in regard to knowledge and information policy problems. Finally, as they have done in the study of natural resource management, systematic analyses of constructed commons across a wide range of collected case studies should lead us to doubt panacea prescriptions drawn from overly simplistic models. Frischmann, Brett M. 2008. “Speech, Spillovers, and the First Amendment.” University of Chicago Legal Forum. 301–333. ————— and Mark A. Lemley. 2007. “Spillovers.” Columbia Law Review 107(1):257–301. Madison, Michael J., Brett M. Frischmann and Katherine J. Strandburg. 2010. “Constructing Commons in the Cultural Environment.” Cornell Law Review 95(4):657-709. —————. 2009. “The University as Constructed Cultural Commons.” Washington University Journal of Law & Policy 30: 365-403. Ostrom, Elinor. 1990. Governing the Commons: The Evolution of Institutions for Collective Action. New York. Cambridge University Press. —————. 2005. Understanding Institutional Diversity. Princeton, NJ. Princeton University Press. 1. See the essay by Helen Markelova and Esther Mwangi in Part 5. 2. See essays by Benjamin Mako Hill, Mike Linksvayer, and Rainer Kuhlen in Part 4. 3. See the summary of Ostrom’s design principles in Conway’s article in Part 5. 4. 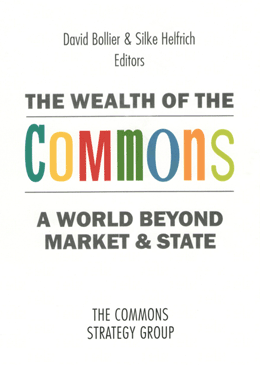 Editors’ note: Many authors of this volume conceptualize commons as productive social systems where the point is not only about sharing common pool resources but also producing commons. 5. On rivalrous goods, see Silke Helfrich’s essay in Part 1. 6. See Mike Linksvayer’s essay on Creative Commons licenses and Christian Siefkes’ essay on commons-based peer production, both of which are in Part 4. Michael J. Madison (USA) is Professor of Law at the University of Pittsburgh. His research focuses on knowledge-based institutions, innovation, and cultural commons. His papers are available at http://madisonian.net/home, and he blogs at http://madisonian.net. Brett M. Frischmann (USA) is a Professor of Law and the Director of the Intellectual Property and Information Law Program at the Cardozo Law School. His research focuses on various different types of commons, including cultural commons and infrastructure commons. He is the author of Infrastructure: The Social Value of Shared Resources (2012). Katherine J. Strandburg (USA) is Professor of Law at the New York University. Her publications focus on cultural commons and the implications of user and collaborative innovation for patent law and of networked communication for privacy. Prior to her legal career, she was a PhD research physicist at Argonne National Laboratory.